We work according to DIN directives and consider the international standards applicable for general ventilation and air conditioning. At the end of the year 2016, the filter standard ISO 16890 came into force for the test and evaluation of air filters for ventilation and air conditioning technology. Here we would like to explain you the general meaning of this standard by means of questions and answers. As of 1 July 2018, an DIN ISO 16890 labelling is mandatory for all filter manufacturers. Therefore, we would like to inform you here, how the previous filter classes of DIN EN 779 will be assignment to the four ISO groups. With the introduction of DIN ISO 16890 the question arises if new filter types are required and which requirements on air filters will be bound. You can find answers here. In order to enable the evaluation of filters for ventilation and air conditioning with regard to their employment in real-life filtering systems and to classify them using filter classes, there exists the filter test standard EN 779. In this case, test aerosols are applied to air filters in order to assess the particle separation. In order to determine the influence on the particle separation, as well as the pressure loss of an air filter and the dust deposition, an artificial application of dust is implemented. In order to assign the filters to the coarse dust filter classes, the average arrestance is considered. This is the ratio of the applied to the separated amount of dust. It results from the step-by-step dust application with ASHRAE standard-filter test dust, up to a pressure loss of 250 Pa, by means of weighing. As can be identified in the table, the average arrestance for these filters is no longer relevant. In case of the medium filter classes, the test filter is examined for its efficiency with a 0.4 micrometer fine oil aerosol (DEHS). 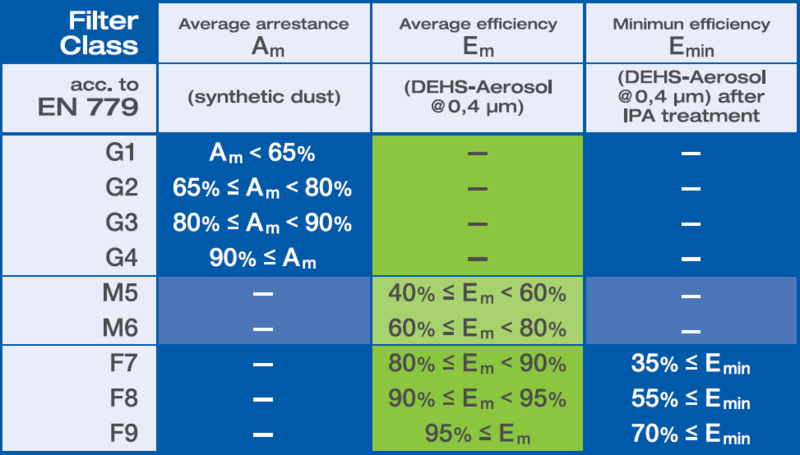 The average efficiency results, in turn, from the step-by-step dust application with ASHRAE standard filter-testing dust, up to a pressure drop of 450 Pa, with averaging of the efficiency values achieved (DEHS). In the case of the fine dust filters, the filter class is stipulated not only based on the average efficiencies, but it is also evaluated according to their minimum efficiencies. For this, the filter sample is immersed into liquid isopropanol (IPA) and subsequently dried. This test is designated as an IPA test. As a result of the washing process, freely-moving electrostatic charges flow from the fibre surface. This should simulate the filtration characteristics which can be expected under extremely critical, real in-service conditions.